Trying a new diet can be frustrating, difficult, and can even cause irritability. It can be extremely frustrating trying to figure out what to buy at the grocery store or how to prepare it in your home. It can also be very difficult trying to find proper foods when dining at restaurants or friends and family members. Yet, a proper diet can be a very positive change in your daily health. Over time, a diet filled with appropriate nutrition from all food groups should become part of your daily lifestyle. A ketogenic diet is a great source for those who need to produce more ketones. During this diet, keep in mind that you’ll want to be in taking more fatty foods. Because ketosis works through changing your metabolism through using fat as an energy source, you’ll want to be storing more fat than you might have previously. 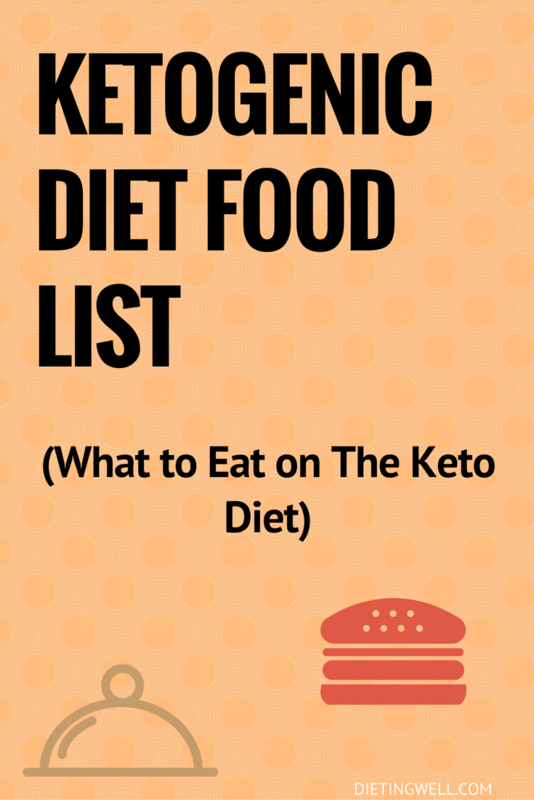 While this can be a daunting thought to overcome, having an appropriate food list should help you establish the ultimate ketogenic diet. There are many options for those looking for a ketogenic healthy diet. It may sound silly to say that you need to eat fat to lose weight or be healthier. However, the fatty foods that you should be choosing will be filled with healthy nutrients. Fats can be very important to our diet. However, eating the wrong fats can also be very detrimental. Fats should be the majority of your daily intake on a ketogenic diet, so be sure to know that you are eating the right kind of fatty foods. Saturated fats like the contents of potato chips, processed pretzels, cookies, crackers, and other snacks do not fit into the fat category of a ketogenic diet. You need to be looking for foods that are saturated and monosaturated fats. Saturated and monosaturated fats are foods constituted of butter, avocado, macadamia nuts, tuna/fish, and shellfish. Similarly, you need to be stocking up on Omega 3’s. Omega 3 is a nutrient that is necessary in creating the right diet. Usually fish carry many Omega 3’s that you need. If you aren’t a big fan of fish, try going to a local supplement store. Omega 3 supplements can be bought in capsule form if you are not a fan of fish. It will help give your body what it needs for a balanced diet. You also need to avoid hydrogenated fats. In hydrogenated fats, you’ll have oils like vegetable oil–this is bad. If you need to use oil, try using coconut oil or spray the pan lightly rather than saturating your food. The less oil you use, the more good fatty elements you can get from it. While organic and grass-fed sources are preferred, here are some great options for building fatty and oil intakes in your ketogenic diet. Proteins are also essential to a ketogenic diet. While proteins should take significantly less space in your diet than fats and oils, you need proteins to be able to create enough energy. Protein will cause you to be less hungry. It will also increase energy and motivational levels, a reoccurring symptoms of creation of ketones through ketosis. When going for proteins, looking for grass-fed or organic options is a healthier choice. You should also look for products like free-range eggs. These options are both better for the animal and for your health. Fish are a great source of protein. If you catch the fish yourself or visit a local fish market, you are likely to get even more benefits due to the natural nature of the fish. While many people aren’t a fan of the green and mushy, veggies are an essential source to your diet. Grown right from the earth, they provide many nutrients that proteins and fatty acids cannot. For healthy vegetables, look for veggies that are grown mostly above ground; Leafy greens are best. You should also be looking for organic vegetables that are grown without pesticides. If you’d like to try for an added bonus, try growing your own fresh vegetables from home. By growing your own veggies, you’ll know exactly where they came from, what has been used to grow them, and where and how they’ve been grown. While veggies are very healthy, be careful to watch for vegetables that are high in sugar. the best type of veggies for a ketogenic diet are those that are dark and leafy. Also, keep in mind that a diet with low carbohydrates cannot allow for plentiful intake of nutrient-rich veggies. However, your carb intake will be high enough that you can include copious amounts of nutrient (including potassium) rich vegetables to offer the body sufficient nutrition. Dairy products can also be a source of protein and a source of Vitamin D. However, dairy should be raw and purchased in full fat, not in low fat. While dairy products should not be taking up very much of your ketogenic diet at all, they certainly should be a part of your nutritional need. Therefore, it’s important to stock up on nutrients from dairy now and then. Nuts can be a great source of protein and nutrients. They are excellent to snack on and will curb cravings. For ultimate nutritional value, nuts are best when roasted. When roasted, the nut becomes free of all pesticides and things that are anti-nutritional while being grown. This gives the nut as most nutritional value as can possibly be obtained. However, be careful to avoid peanuts. Peanuts are considered a legume which is not an often a recommended option for those on a ketogenic diet. If you are on a ketogenic diet for medical reasons, check with your doctor before opting for a choice of peanuts. You should also look for nuts that are unsalted. Often times, sunflower seeds and cashews will already come pre- salted. Check the box or container to be sure that you are only getting the nut–not processed sodium with it. Remember that nuts are very high in Omega-6 fatty acids, so you’ll want to limit your intake. If consuming nuts every day, more than a handful will not be beneficial to your diet. However, eating and baking done in moderation will give you many nutrients that will provide you with protein and Omega-6’s. If you are not familiar with ketosis or the ketogenic diet, know that one of the most popular symptoms that occurs almost instantly is dehydration. A ketogenic diet has a natural diuretic effect. While symptoms of dehydration will lessen over time, it should be noted that beverages will become an important element in your diet. While on a ketogenic diet, always keep a bottle of water with you. Whether you are at work, at the gym, going to class, or meeting family members, bring hydration. It may help to invest in a nice water bottle. A water bottle with a preferable pattern or cooling system may help you to hydrate more often. If you’ve had urinary infections or problems or bladder infections in the past, you will need to be more aware than others on a ketogenic diet. because of previous health conditions, you will want to drink twice the amount of what you believe you need. Water is the best beverage to keep hydrated. It’s natural, free of any anti-nutrients, and benefits your body in every way that it needs to. In order to meet dehydration needs, drink at least eight glasses of water a day. Remember that our bodies are 2/3rd made up of water. It’s an essential element. However, keep in mind that too much water can also cause detrimental health effects like water poisoning. Check with your medical professional to know how much water you should be in taking for your ketogenic needs and bodily weight. If you get tired of regular water, you can try flavor packets like crystal lite. Yet, be careful because these flavor packets often contain carbohydrates which is detrimental to a ketogenic diet. A ketogenic diet doesn’t need to be painful. In fact, it can be beneficial to your lifestyle if done properly. In many cases, a ketogenic diet will give you all of the nutrients that you need and then some. Be sure to follow this comprehensive list if you are on a ketogenic diet to be sure that you receive all of the proper nutrients you need while in ketosis. what are your favorite ketogenic diet foods? Leave a comment below! I am new to keto diet and I do love fruits, we are in perfect season for fruits and veggies. Can I have any fruits without limits on keto diet? Anna, Fruit is off the list because of the high sugar it contains. under vegetables you don’t mention any? you have dairy info…is that a typo? We were wondering if we can eat as much as we want off the Keto list, or is it just a certain amount allowed? That’s a very good question! I need that answer too! Please! You can use this link http://keto-calculator.ankerl.com/ to enter your weight, height, gender etc and it will give you an estimate of how much you should eat for each food group (carbs, protein, fat) and the calories you should consume to get results. Why is peanut butter allowed but not peanuts? Because it has sugar and other added stuff usually. If you can find 100% natural peanut butter I think that’s fine. Peanut butter is allowed? It’s full of carbs!!! I am going to stick with the “Keto” I know that works! Avoid: Bread, Potatoes ( white & sweet), rice , pasta, beans, flour, sugar, beans. No soda, cakes, cookies , chips, processed foods ( hotdogs, turkey bacon, popcorn,), diet soda, grits, oatmeal… EAT: Lean meats, fish ( seafood), veggies ( no corn or potatoes)& drink-drink-drink water!!! BTW; lemon & lime are only allowed fruit because they don’t have sugar; use for flavor. Also, mayo & mustard is ok, but no ketchup due to sugar! Is there any type of pasta at all? Whole wheat, or whole grain? Costco has noodles made from edamame! Edamame are considered a legume, like peanuts, which is not recommended in a keto diet. Miricle Noodles, walmart carries them or amazon. No carbs, no calories. Very filling. I don’t know what I’m doing wrong! I haven’t lost any weight in a month! I’ve been eating fats and protein. I’m not sure if I’m eating too much cheese and almond butter. Cheese is on the list (hard and soft)! I’ve seen it only other keto lists as well. Don’t forget you still have to burn more calories than you eat in order to lose weight. Download the “lose it” app and start tracking your calories. what can you use to substitute fish, tuna, salmon or any other sea food if you do not eat sea food? Organic vegetables are grown with pesticides. Please stop perpetuating this myth. In FACT many organic pesticides used are derived from organic and poorly understood sources, which have shown to have cancer risks. ALWAYS wash your vegetables, especially organic ones. Im just trying to detoxify from the last 20+ yrs of vaccines. I have crohns & have a hard time chosing what my body will tolerate..1 thing is fruit n veggies plus wild game (moose, dead, salmon etc)..Ive lost 250lbs in last few yrs so I dont need to lose weight..just detox. Can I still follow this vut have some fruits still? Have you looked in to Isagenix? Sounds perfect for you. I have to avoid the lactose laden foods even though I love them but my system can’t handle it anymore. I eat a banana daily… and sometimes sweet potatoes plain or with cinnamon, flax seeds and coconut oil would this throw off the ketosis state? How long would one need to be on a ketogenic diet? Bananas have as much sugar in them as a Snickers bar (medium banana = 27g of carbs)and sweet potatoes are full of sugar as well so no you can’t eat that and stay in ketosis. You only get 50g of carbs a day, preferably no more than 20-30g. As far as how long you need to be on the diet, that’s up to you. As soon as you go back to your old eating habits (eating carbs) you will gain weight back since you will no longer be in ketosis and burning fat, but burning glucose again. Can you tell me is like the tuna pouch two boiled eggs n 1 cup of green vegetables with two chicken legs considered under 20 carbs a day. I work long hours n want to do something easy n quick with cooking. Thanks in advance for your help. About beberages…. theres BOLERO that gives flavour to the water and has no carbs. PS sorry forgot to ask about yogurt….I do love my breakfast yogurt….. I found very useful information in this article. I follow some Keto foods and the results are unbelievable. Thank you for sharing such a great information. Really want to do this with my son; however he hates eggs, and many of the sample breakfasts have eggs. Any suggestions so that he’s not eating yogurt and strawberries every morning? Thanks! I want to lose weight in a month’s time as i want to attend my bestie’s wedding.. The dietitian suggested me to try keto diet for a month. But while i was surfing i came across a blog from everydayhealth that stated that that there are also risks involved in it -https://www.everydayhealth.com/diet-nutrition/ketogenic-diet/. Please let me know if any of you have tried this kind of diet before? I lost 41 lbs in 41 days so far. I will like to try the keto diet however I am lactose intolerant and can’t have dairy. How do I supplement that part of the diet.